Most merchants we talk to are unaware of what Interchange Optimization means and the beneficial financial impact it has on a company’s bottom line. WHAT TYPES OF CREDIT CARDS QUALIFY FOR INTERCHANGE OPTIMIZATION? The cardholders each card brand (e.g., Visa and MasterCard) caters to in allowing for Interchange Optimization are those that use Business-to-Business credit cards, Corporate credit cards, Commercial Purchase credit cards, and Government credit cards. Optimization, we find a diverse mix of businesses can benefit from Interchange Optimization such as retail merchants, merchants that offer professional services or products to consumers, business-to- business merchants, and eCommerce merchants. Please note that when we analyze a merchant’s credit card statement many times, we surprise a merchant by the number of business cards, corporate cards, and commercial purchase cards that they are taking. can all qualify for Interchange Optimization Savings. WHAT IS REQUIRED TO ACHIEVE INTERCHANGE OPTIMIZATION? As mentioned above to qualify for savings from the card brands and receive lower interchange rates on qualifying credit cards the card brands require every merchant to submit additional information with each transaction, and in return, each merchant can realize anywhere from .05% to 1.10% savings on each qualifying credit card payment transaction. For all sorts of businesses, such as retail and card-not- present and eCommerce, we provide and offer the technology and payment systems required for merchant’s to provide the required additional data needed in order to optimize their interchange rates, lower their interchange fees, and maximize their savings. Our payments systems can automate the entire Interchange Optimization process behind the scenes so that a merchant never misses out on getting the lowest interchange rate possible. Our Interchange Optimization payment systems are easy to use for retail, keyed in, and eCommerce merchants hence requiring no additional steps by them to process payments. A number of our payment systems are automated to do all the administrative tasks behind the scenes to comply with the card brands additional data requirements thus optimizing each merchant’s Interchange rates on every eligible credit card type. 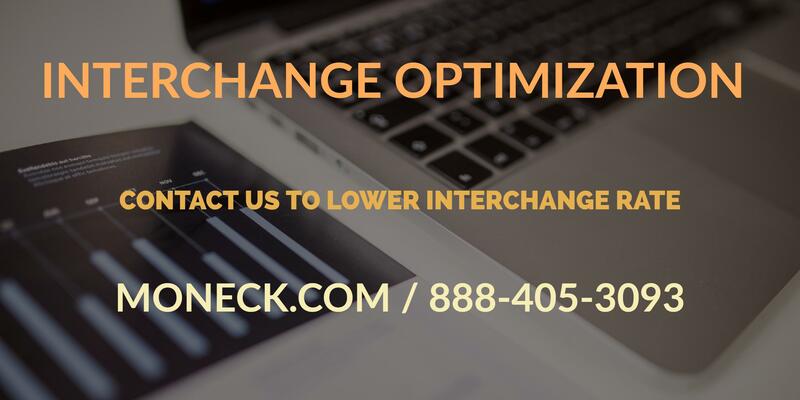 If you are curious to learn more about Interchange Optimization and how you can experience deeper savings for your business, please contact us at Moneck Payment Solutions 1-888-405-3093.